I've always considered myself an entrepreneur. As long as I can remember, I’ve always been a planner, a creative thinker, a self-motivated leader from my first lemonade stand to backyard carnivals to raise money for local charities. When I was sixteen, I started a catering company, which I operated for 10 years before moving on to being a manager and trainer in the restaurant industry. But that was a lifetime ago. Since beginning The Armchair Genealogist 9 years ago, (yup anniversary coming up in a few weeks) I often get asked questions about different aspects of my genealogy business. So, I decided it was time to add another feature to The Armchair Genealogist blog, The Genealogy Entrepreneur. 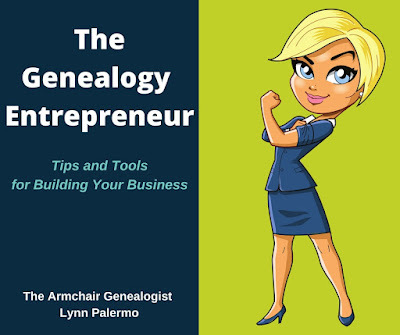 This is a new series for anyone thinking of starting up a genealogy business. Or if you’ve been in the genealogy market for a while, perhaps you started on a shoestring budget, and you're ready to take your business to the next level, then you too may benefit from The Genealogy Entrepreneur. Don’t worry, we’re still blogging about researching and writing our family history, but dispersed among those posts will be tips and tools for those of you who want to turn your passion for genealogy into a business. If you’ve created an online presence, a blog or website, if you’re taking clients, or conducting genealogy classes or speaking then it’s important to continually invest in yourself and your business. Advancing your business might mean a financial investment, or an outlay of your time, often both. In this first series of The Genealogy Entrepreneur, we’re going to cover the following 5 ways to invest in your business. They don't all require money, some will purely be an investment of your time. When you have a smart logo, it helps to reveal your identity to possible clients, followers and consumers. Imprinted on your products, your business card and your website, your logo communicates ownership. It tells the world/potential customers who you are, what type of product or service you sell, or what benefit you offer consumers. Your logo will mark your website, your products and should be designed to draw interest. It should induce the curiosity of potential customers through its design and colour. Your logo should encourage them to at least stop to take a look and hopefully stick around to read a post or two and eventually enlist your services or buy a product. A graphic designer can help you to design a logo that echoes who you are, but it should also differentiate you from everybody else. A good logo will set you apart from the rest. In the genealogy industry, trees are a symbol often used in our industry. That’s fine! But how you are going to distinguish your tree from everyone else? A good logo should strive to be different. How will you stand out in the crowd? Seek out a graphic designer either in your local community or online. Your designer should take some time to get to know you and your story, your services and your demographic. A logo will address all of these aspects of your business through the symbols used in the logo, the colours, and the fonts. A good graphic designer will also investigate other businesses in this space. You don’t want your logo resembling that of a competitor. Invest some money and time in developing a logo that identifies your business while at the same time separating you from the pack. If your designer is not taking these steps move on to someone else. Your logo is an essential part of your overall brand identity. Stay tuned for our next post, on Branding Your Genealogy Business, what is it, why you need it and how it affects your marketing strategy.